Finding the Odd one out from the given set of numbers makes a very interesting brain teasers. Here I am posting some riddles in which one has to find which number is odd one among the others. All numbers except one follows certain pattern or rule which exactly one number does not follow. So your task is find that number which stands out from the group. I have posted the answers of these brain teasers later at the end of this post with reasoning. One may think differently and may come up with alternative answer. Please do post your answers in the comment section of this post along with your reasoning. 1. Spot the Different Picture Brain Teasers for teens with answers: These the Picture Odd One Out Puzzles in which three puzzle images are given in each of the puzzle. Your challenge is to find which puzzle image is different. 2. Picture Brain Teasers to find which Picture is different: These are very interesting Picture Brain Teasers for Kids in which one has to find the Odd One Out Picture. 3. Tough Odd One Out Picture Puzzles for Teens and Adults: Checkout these Odd One Out Picture Puzzles in case you are looking for tough Picture Puzzles. 4. Picture Puzzles for Teens With Answers: There are lots of different type of Picture Puzzles to twist your mind along with Odd One Out Picture Puzzles. 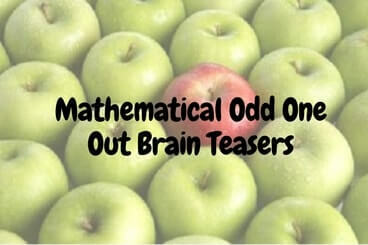 Answer of these Mathematical Odd one out puzzles is given below. I have hidden the answers so that one does not see the answer inadvertently. To look the answer of a particular brain teaser, do select the text between that numbered puzzle till the next number. A1. 754 is the odd one , sum of all the digits of the number are 11. Only in 754 sum of digits is 16. A2. 654 is odd as in all other numbers sum of digits at unit place and at tens place is equal to the digit at hundreds place. A3. 769 is odd as all other numbers are prime numbers. A4. 243 is odd as all other numbers are perfect square but 243 is not a perfect square of any number. A5. 44, is odd as all other numbers are multiples of 3. But 44 is not. A6. 14453646 is odd as all other numbers are written as shown below, but 14453646 doesn't follow the pattern. A10. (e). 8662, in others every time number on ones place is moving one step forward anticlockwise but 8662 doesn’t follow the series. Here is answer to 12th Brain Teaser Question of post titled "Simple Math Riddles for Teens and Kids with Answers to Twist your Brain". Answer is 206. If abc x def = g then g = (a+b+d+e)(c+f).